Instructor Kyle Lincoln (right) with two students in Athens for a short-term hybrid study abroad course. Photo: Nisveta Fejzic. For those students for whom a full term abroad isn’t feasible, short-term hybrid study abroad courses are often the perfect solution, combining online coursework with a study abroad immersion experience of 1-2 weeks – perfect for students working full-time while in school, caring for a family or seeking a study abroad experience on a budget. “The demographics of higher education are changing, and this forces those of us who work in higher education to change the way that we think about international education,” said Hannah Verity, College of Arts & Sciences director of Global Programs. “Traditional study abroad experiences do not fit for all students, particularly non-traditional students. The benefit of Webster’s distinctive short-term hybrid courses is that they allow students who may not be able to participate in a longer stay abroad a meaningful intercultural experience. A unique component of this innovative format is that the immersion piece is connected directly to the course curriculum, creating an intentional learning experience. “Both students and faculty are excited about these new offerings,” Verity said. That excitement has translated to growing numbers of students enrolling in short-term hybrid courses at Webster. 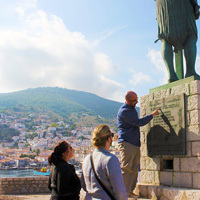 According to Webster's director of Study Abroad and International Projects Guillermo Rodriguez, enrollment in short-term hybrid courses has increased steadily over the past four years. In the 2010-11 academic year, 62 students traveled abroad short-term; in 2014-15, that number swelled to 135. One recent short-term study abroad course took nine students to Athens, Greece, for "City Life: Ancient Athens," a keystone seminar that also provides students required Global Citizenship Program (GCP) credits toward graduation. Read more about the experience in Lincoln's Athens course at Global Thinking, the blog for the College of Arts & Sciences.